If there is one thing that is consistent among purebred animals, it must be the desire for ancient – and preferably exotic – origins. The latest and greatest may be desirable with high tech equipment, but we seem to prefer our horse and dog breeds well-aged. 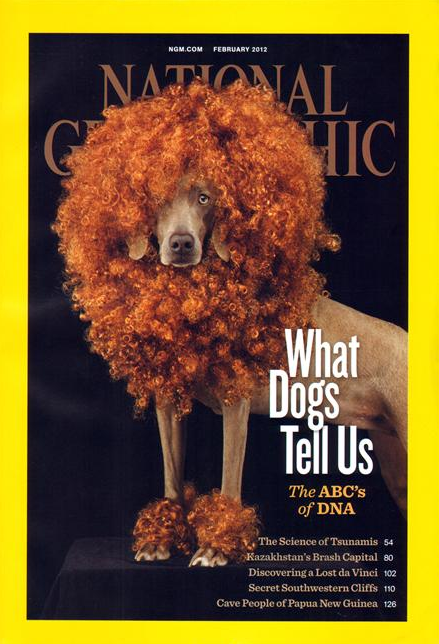 In the past I have enjoyed giving a presentation that pokes a little fun about breed mythologies. I am fortunate that my audiences have, so far at least, all been good sports, because this can be a rather touchy subject for a lot of people. That is unfortunate, because many of the accepted stories about the origins of various breeds have not held up to closer scrutiny. As geneticists continue to analyze different populations, it is becoming clear that some populations are not remnants of an ancient group, but rather relatively modern attempts to recreate those animals – or in some cases, a romantic notion of what those animals might have been like. For those that do not have a strong attachment to the original stories, the truth can be far more interesting. That is certainly true for the research being done by the Village Dog Genetic Diversity Project headed up by scientists at Cornell University. They have been collecting samples from hundreds of semi-feral dogs in remote areas in Africa. Their findings have been somewhat surprising. 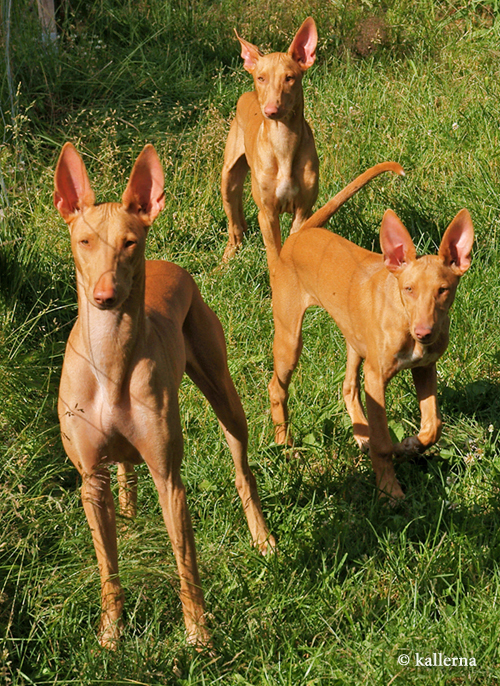 Meanwhile, modern breeds that have been thought to descend from African populations, like the Pharaoh Hounds (above, photo courtesy of Wikimedia Commons) and the Rhodesian Ridgeback, clustered with Western breeds. These results are consistent with [previous results] showing that Salukis, Afghan hounds, and Basenjis cluster with ancient, non-European breeds, while Pharaoh hounds and Rhodesian ridgebacks do not. Although this coarse sampling (3 countries) is suitable for detecting truly indigenous versus reconstituted ancestry in putatively African breeds, analysis including village dogs from more regions will be necessary to better localize the ancestral origins of these breeds. This study is reminiscent of the one done a few years ago on the origins of the Arabian Horse. The author of that study, “Speculations on the origin of the Arabian Horse breed“, found persuasive evidence that the modern Arabian was as much a Victorian construct as it was a uniquely pure, ancient breed. Obviously there are not many ideas more scandalous in equine circles than Arabians being created “from many different breeds and populations” with a history that does not exceed 200 hundred years (ie., 1809). To imagine that carefully preserved purebreds are mongrels, while feral dogs bred without any human selection in the streets of Africa are free from outside “taint” and “pure” descendants of ancient ancestors, really does turn what we think we know about our animal companions on its head. Edited to link to the full version of the Głażewska “Arabian origins” paper. As I mentioned in the previous post, I want to do a series of posts on the subject of genetic diversity. Obviously the primary focus of this blog is horses, but for this particular topic I will be jumping back and forth a bit between the world of dogs and the world of horses. The situation in many purebred dog breeds is quite dire. With few exceptions, horse breeds do not face nearly such difficult circumstances, and because of that, most breeders of horses do not face the same difficult choices. Still, the factors that allowed purebred dogs to reach this point are not entirely absent in horses. It is also true that because dogs are so pervasive in our culture, many people have had their views, particularly those about what constitutes a ‘proper breed’, influenced by the world of pedigree dogs. For that reason, I will present the situation with dog breeding as a cautionary tale for those interested in horses. So what has happened to dogs? 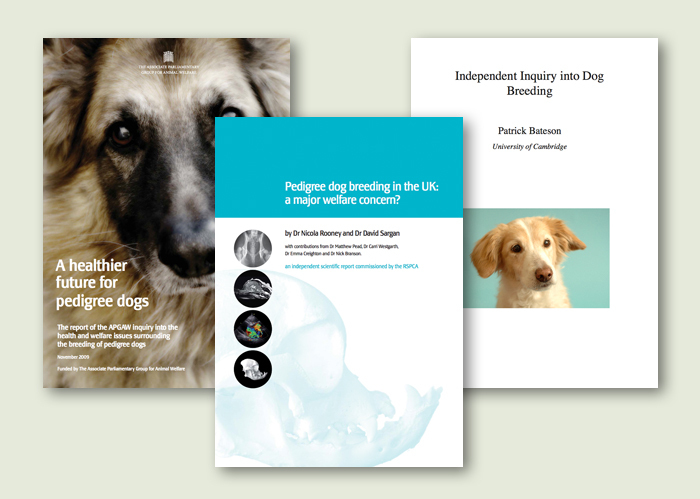 Three independent inquiries were made in the aftermath of the British documentary Pedigree Dogs Exposed. These produced three separate reports: the Bateson Report, the APGAW Report and the RSPCA Report. All three groups found that the health and welfare of purebred dogs were compromised, and highlighted two contributing factors. The first of these was selection for exaggerated anatomical features. The second was the dramatic increase of inherited disorders brought about by inbreeding. An in­creasing number of hereditary problems are being recognised in companion animals, especially dogs. Many of these are the consequences of inbreeding or breeding for genetically defective animals. Some are the result of deliberate selection for abnormal or unnaturally accentuated physical characteristics for fad or fancy. As that quote shows, both exaggeration and inbreeding were concerns twenty-four years ago. The observations made in the three reports were not new, but this time there has been public pressure to address the problems. It is the efforts undertaken by the Kennel Club (KC) to address the first issue – the harmful anatomical distortions – that are currently the focus of much controversy in the British dog world. That controversy has created ripples over in the American dog fancy as well, with representatives from the American Kennel Club (AKC) insisting that such measures will never be taken in the United States. Meanwhile the second largest American registry, the United Kennel Club (UKC) has stepped forward to claim the high ground in addressing the issue. This first issue will not be the focus of the posts made here. As important as the issue is to the dog world, it is not a widespread problem facing horse breeds. With a few exceptions – extreme heads in some halter Arabians, for example – breeders are not seeking to exaggerate the equine form. Horses are not anatomically malleable the way dogs have proven to be. It is the second category of issues – those related to inbreeding – that are the bigger concern for horses. 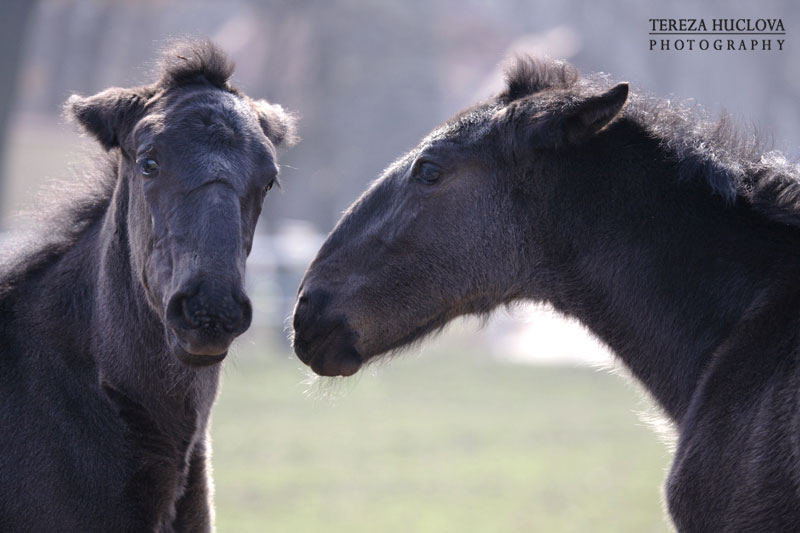 There is no question that within the horse world, there are endangered breeds with very small populations. Many of the draft and coaching breeds have experienced dramatic bottlenecks when the engine made them obsolete. It is also true that closed stud books and inbreeding are found in some horse breeds, and that some breeds have seen a rise in genetic diseases. Unquestionably inbreeding can lead to a loss of biological fitness. …. Inbreeding can result in reduced fertility both in litter size and sperm viability, devel­opmental disruption, lower birth rate, higher infant mortality, shorter life span, increased expression of inherited disorders and reduction of immune sys­tem function. The immune system is closely linked to the removal of cancer cells from a healthy body, so reduction of immune system function increases the risk of full-blown tumours. These same observations are echoed in the other two reports. All three drew upon the expertise of geneticists for those conclusions. However much inbreeding is considered a valid tool by some animal breeders, the above statement is not particularly controversial within the field of genetics. Concerns about the downsides of inbreeding are pretty consistent across a large body of studies. It is the growing awareness outside that field that is new. In short, while the Victorian breeders were crafting dogs to suit their tastes, they were also creating genetically isolated populations, little knowing how useful they might be to scientists in the future. The possibilities are especially abundant for cancer, certain types of which can show up as often as 60 percent of the time in some dog breeds but only once in every 10,000 humans. Selection for phenotypic traits has resulted in the latent selection of genetic diseases and some breeds now have a high incidence of particular diseases, for example, the Samoyed, which has a risk ratio if 17.3 for diabetes and the boxer which has an unusually high incidence of various cancers. The breed specificity of particular diseases lends dogs to be ideal candidates for comparative genetic association studies. That is the precarious position of purebred dogs in 2012. Their genetically isolated populations have several hundred known genetic diseases. Because the dogs have been maintained in small subpopulations with decreasing genetic diversity, the incidence of those diseases has risen to the point that researchers have found them to be an invaluable resource. That may be good news for those seeking answers to human disease, but it is far from good news for the dogs themselves. It certainly should give pause to breeders of other animals that are considering taking (or continuing down) the same path. It also merits thoughtful discussion by all involved with the animals affected – those that breed them, those that exhibit them and those that welcome them into their lives as companions. My oldest son has been struggling with freshman Biology, so the concept of evolution has been on my mind a lot lately. I have also been reminded that evolution applies, not just to organisms, but of points of view. Sometimes it can be easy to forget that you once held a different view – unless of course you are foolish enough to write it down for others to find later. I have been writing about horse color long enough now that I have had that happen! As anyone who is friends with me or my family members on Facebook can probably tell, we play a lot of games at our house. The guys play ruthlessly, so we often joke that it’s not a real game unless someone cries. As the mother, and resident peacemaker, this has made me keenly aware of the concept of game mechanics. Those are the factors that make a game hard enough to be a challenge without being needlessly frustrating. 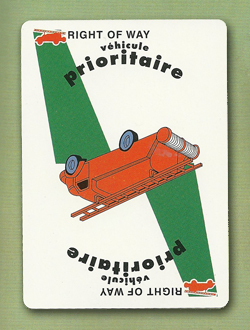 The card above comes from the French game Milles Bornes. It was a game I played with my siblings as a child, but somehow I missed the fact that the game had terribly bad mechanics. Certainly they do not work for my own family! That’s because this card unbalances the game. It did not take long for my children to figure out that once you have this card, it is almost impossible to lose. So someone finally draws the Right of Way, and someone else cries. Whenever someone suggests this game, most of us just groan because we know what is coming. What we need to do is experiment with altering the rules to make the game more fair, but somehow we always end up using the traditional rules. I have often wondered why people in the animal fancies – that is, the hobbies devoted to breeding and showing purebred animals – don’t question their own game mechanics. I suspect that is because many are unaware that the “rules” the activity has are exactly that: game mechanics. Why do the spots have to be just so big, and just so regularly spaced? Why can the tail end be white but not the feet? Why does it matter if the white collar circles all the way around the neck? Do any of those things actually matter to the well-being of the animal? Do they contribute to his ability to do the job he was originally bred to do? Are they tied to an agreeable temperament? The answer is usually no. What they are about is game mechanics. The game, which in this case is competitive exhibitions of animals, has to be difficult enough to keep the interest of the participants. By adding color requirements to the list of desirable traits, the game is made more challenging. The more specific the requirements, the greater the challenge. Breeding to a standard is already a challenge. 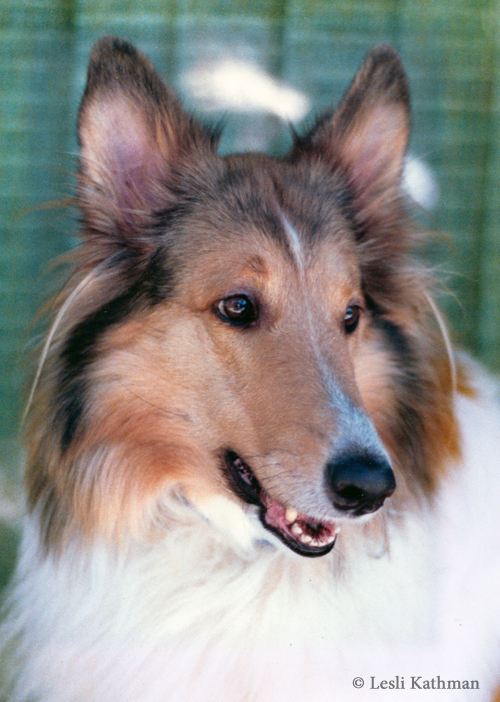 The head on a Collie, which is one of the most important aspects of type in that breed, is required to have very specific angles. The parameters of this are outlined in detail in the breed’s illustrated standard. 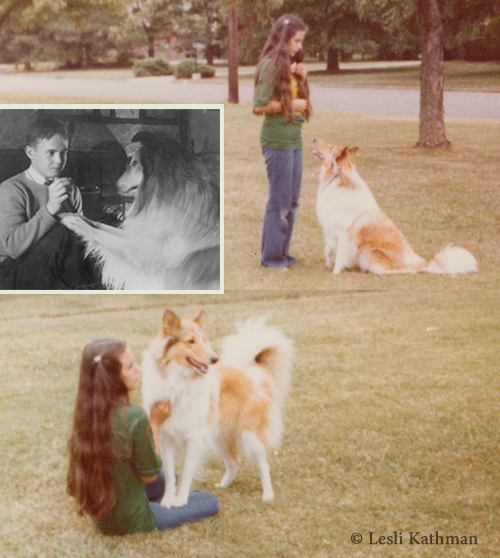 (The Collie Club of America has one of the most instructive standards in this regard.) Unfortunately the desired head shape fits between two norms that the canine skull structures tend to take. The middle image is the ideal Collie head. 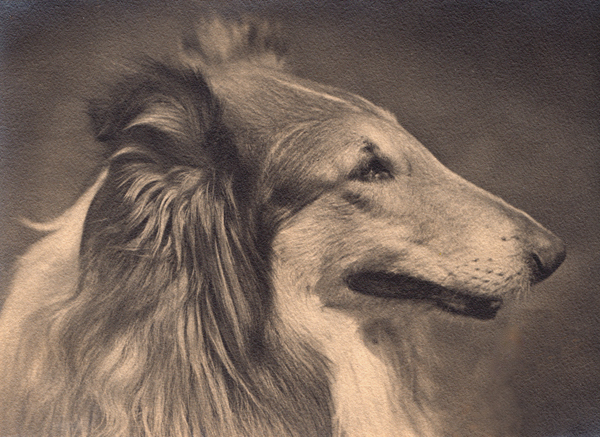 The heads to either side represent the extremes, with the “Borzoi” type roman nose to the left and the “Farm Collie” dished face to the right. One of the challenges to breeding Collies is getting that elusive middle image. If you are breeding Collies, that is part of the game. For some animals color and markings are part of the challenge. Yet color is different in one significant way. Compared to something like the angles of the skull, color is pretty easy to predict. Take Boxer markings, for example. Boxer breeders like flashy white markings like the ones seen on these dogs. In most breeds of dog, this kind of pattern where the legs, belly and collar are white is thought to be recessive. It is most often called Irish spotting, though in Danes it is called Mantle. 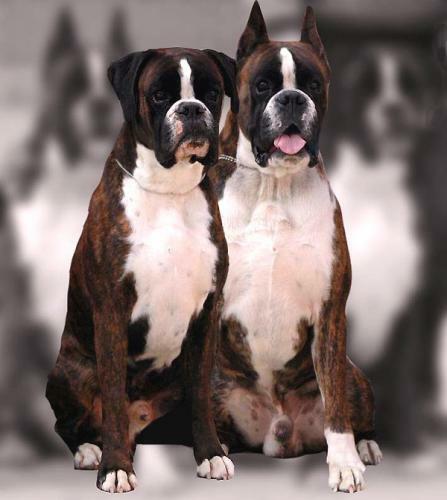 Boxers are different in that while the white occurs in much the same areas, the pattern is incompletely dominant. 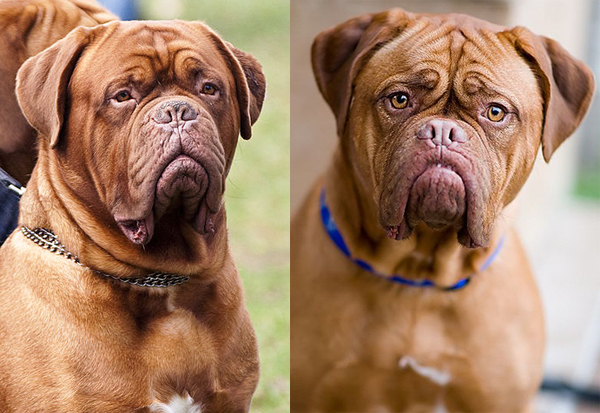 Dogs with one copy look like the pair above. Dogs with two copies look like this. 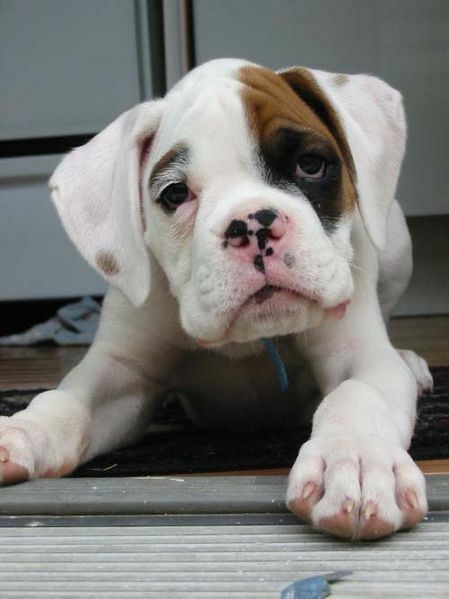 Puppies like this are called White Boxers or Check Boxers (if there are significant patches of color inside the white). White and check Boxers cannot be shown. This is the American Boxer Club position on white Boxers. ABC policy strictly forbids registering white Boxers with the American Kennel Club, as well as selling white Boxers or breeding white Boxers. The ABC also requires that white puppies not be included in the count on the AKC litter application form. The ABC has never condoned or encouraged the culling of white puppies. Yet breeders know this is what they will get. It is entirely predictable. If breeders are using white trimmed dogs in their breeding programs (and trends that I have observed suggest that most are), then this is the fate of 25% of all Boxer puppies born in show breeding programs. If the average litter is eight puppies, then each breeding produces two “waste” puppies right out of the gate, before any other aspects of quality are going to be assessed. What if the hoped-for improved quality for that litter happened to fall to one of those white puppies? The parent registry requires that you not even retain the dog for breeding. That makes eight “waste” puppies – and another two additional ones that will be white the next time. There are worse situations where the color requirements produce a lot of predictable culls. Harlequin Danes are the result of the merle gene and a modifier that strips away the silver color so that the background is white. Merle without Harlequin is not an acceptable color, but Harlequin is a homozygous lethal so all living Harlequins are heterozygotes. That means half the litter will not have the harlequin modifier and will be merle – a color not permitted. 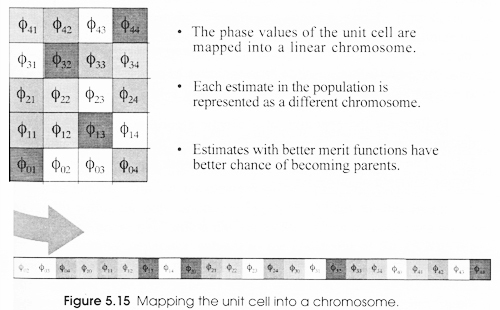 It gets even more complicated because merle causes defects (and the wrong coloring) in its homozygous form. That means ethical breeders will be crossing to non-merles, so only half of the puppies will inherit merle. If the breeder is lucky, most of those will be the ones that get the harlequin gene, too, but that’s not a given. To stack the deck even further, the Harlequin gene is “leaky” so undesirable merle patches sometimes show through. The potential for a lot of “pet quality” colors is pretty high. Those are the rules of the game as it is currently played. Many of these rules date back to the founding of registries. Yes, that makes the limitations traditional, but it also needs to be understood that the men (and it was largely men) making those rules lived in a different world, and looked at animals differently. How easy is it to place a half-dozen off-colored puppies that will one day grow to giant size today, when many families cannot even fit a regular dog into their lifestyle? And are we comfortable with a built-in percentage of “waste” in a world where perfectly healthy animals go begging for a home? Games only work if there is a challenge. The downside to this kind of challenge is that, depending on how hard it is to get it right, you are going to have a certain amount of misses. With animals, that means offspring that have no future within the fancy. Obviously we all expect fanciers to behave responsibly in regards to the excess animals they produce, and many breeders go above and beyond in this regard. But still the structure of the game ensures that some portion of the animals created will not have a place. When those undesirable animals are the sure outcome of something that is desired, then maybe it is time to reassess the rules of the game in light of the world as it is now, and our modern understanding of animals as fellow beings rather than objects. We do have the power to write new rules. Update: It has been brought to my attention that the American Boxer Club website page on white Boxers does not have current information. In 2004 it was voted to amend the Breeder’s Code of Ethics so that breeders could offer Limited Registration papers and recoup medical expenses when placing white puppies. It should also be noted that until 1985 the Code of Ethics did not allow for placement of white puppies, which meant that while the statement that culling was never encouraged is technically true, the only action officially allowed was that the breeder keep every white puppy born. My original purpose for the upcoming set of books was the explore the history of color in the different breeds. I did have another motive, though. 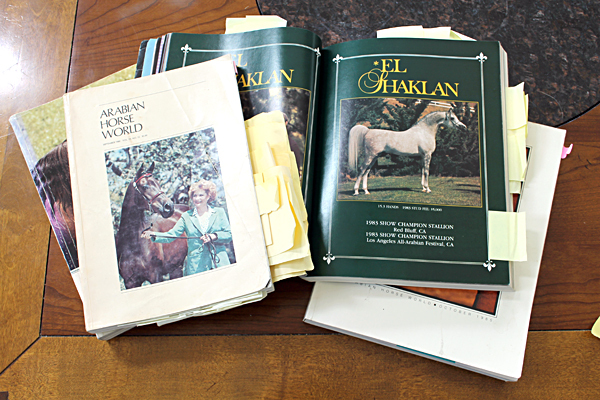 It is impossible to tell the story of those colors without also telling the story of the breeds themselves, so in many ways the books are as much about breed history as they are about color. The idea of “breed” – and the related concept of “purity” – is often misunderstood. As anyone unfortunate enough to get me started on that topic is aware, I believe this situation harms animals. Purity of blood should never trump health. That brings me to the horses pictured in this post. In writing the books, I have reached out to various registries and breeders for photographs. One of the most generous responses came from the Kladruber Stud in the Czech Republic. Countless pictures filled my inbox, many far more suited to a coffee table picture book than my more modest project. 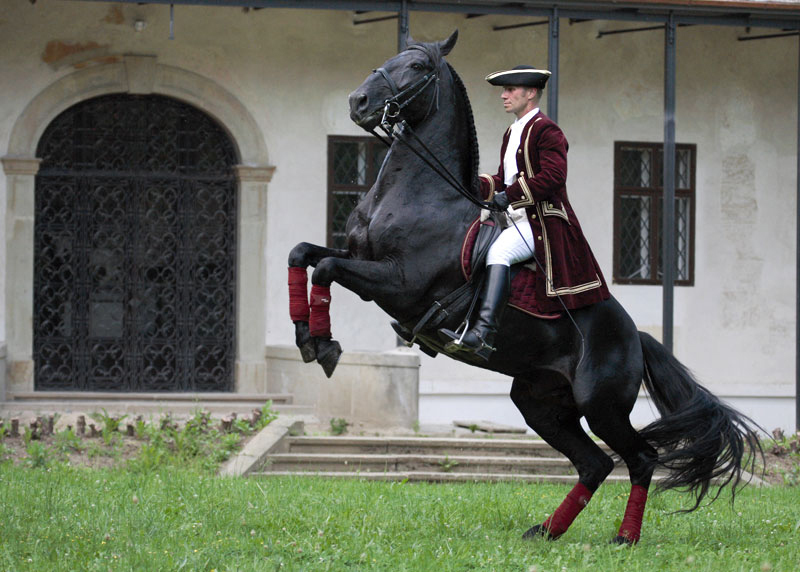 Kladrubers are the last of a type of horse once known as galakarossiers, or ceremonial carriage horses. Kladruby nad Labem where they are bred is among the oldest of the European royal studs, having been established in 1560. The farm is currently on the Tenative List for UNESCO’s World Cultural Monuments. 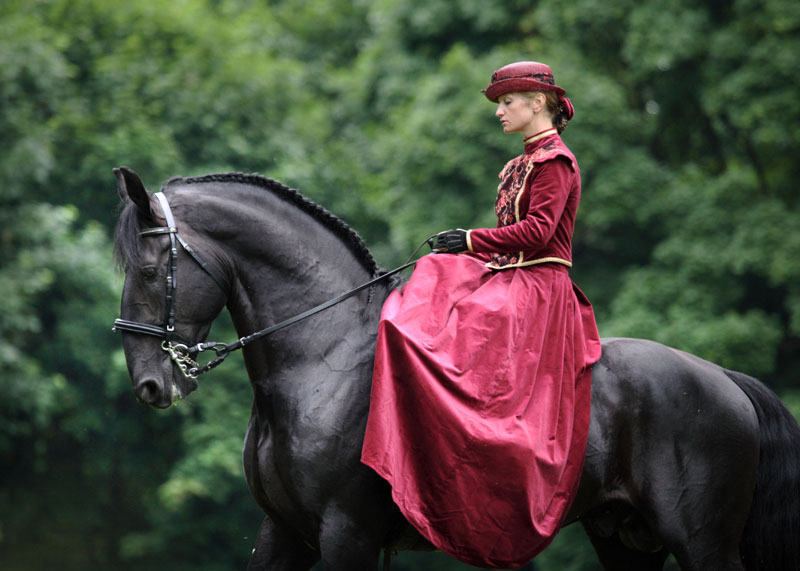 Like most of the old European carriage breeds, the Kladruber is endangered. In writing the books, one of my hopes was to raise awareness of some of these little-known breeds. But in the case of the Kladruber, they also serve as a model for intelligent preservation of rare animals. There are two “breeds” of Kladruber, the Old White and the Old Black breed. This is in keeping with how color stood in for breed in the sixteenth and seventeenth centuries, by the way. The black variety was almost destroyed in the early twentieth century, with only one surviving stallion line and four purebred mares. Those directing the restoration made the decision to outcross to maintain the genetic health of the population, while still preserving the historical baroque type. This wasn’t actually as radical as it might seem to those used to equating breed with purity. It was how Kladrubers were originally bred. It is how horses have historically been bred the world over. It is my hope that by telling the stories of these different breeds, more people realize that diversity and not absolute purity is really what is traditional. And if that opens some minds to the less common colors out there, that wouldn’t hurt my feelings either!